79. Moffitt W., Liehr A. D., Phys. Rev., 106, 1195 (1957). 80. Moss R. E., Advanced Molecular Quantum Mechanics, Chapman and Hall, London, 1973. 81. Mulliken R. S., в кн. Selected Papers of Robert S. Mulliken, Part VII (eds. Ramsay D. A., Hinze J. ), Univ. of Chicago Press, Chicago, 1975. 82. Murnaghan F. D., The Theory of Group Representations, Johns Hopkins Press, Baltimore, Maryland, 1938. 83. Myers R. /., Wilson E. B., J. Chem. Phys., 33, 186 (1960). 84. Nielsen H. H., в кн. 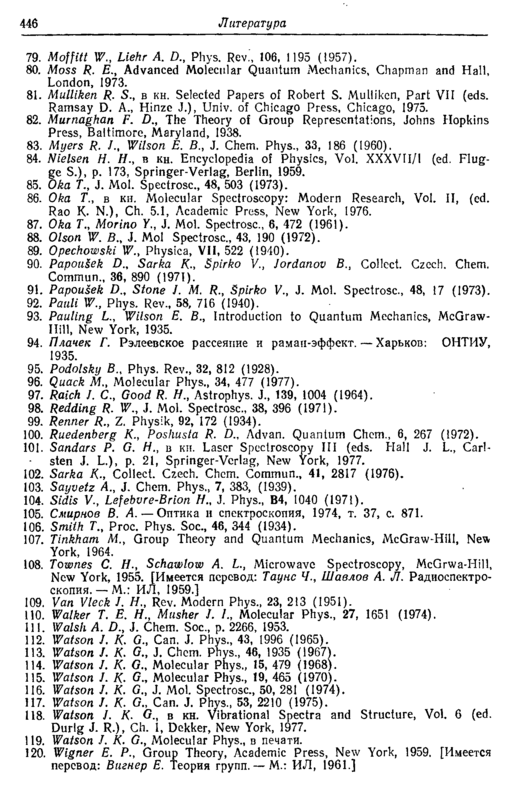 Encyclopedia of Physics, Vol. XXXVII/1 (ed. Flug-ge S.), p. 173, Springer-Verlag, Berlin, 1959. 85. Oka T., J. Mol. Spectrosc, 48, 503 (1973). 86. Oka Т., в кн. Molecular Spectroscopy: Modern Research, Vol. II, (ed. Rao K. N.), Ch. 5.1, Academic Press, New York, 1976. 87. Oka T., Morino Y., J. Mol. Spectrosc, 6, 472 (1961). 88. Olson W. B., J. Mol Spectrosc, 43, 190 (1972). 89. Opechowski W., Physica, VII, 522 (1940). 90. Papoulek D., Sarka K., Spirko V., Jordanov B., Collect. Czech. Chem. Commun., 36, 890 (1971). 91. Papousek D., Stone J. M. R., Spirko V., J. Mol. Spectrosc, 48, 17 (1973). 92. Pauli W., Phys. Rev., 58, 716 (1940). 93. Pauling L., Wilson E, B., Introduction to Quantum Mechanics, McGraw-Hill, New York, 1935. 94. Плачек Г. Рэлеевское рассеяние и раман-эффект. — Харьков: ОНТИУ, 1935. 95. Podolsky В., Phys. Rev., 32, 812 (1928). 96. Quack M., Molecular Phys., 34, 477 (1977). 97. Raich J. С, Good R. И., Astrophys. J., 139, 1004 (1964). 98. Redding R. W., J. Mol. Spectrosc, 38, 396 (1971). 99. Renner R., Z. Physik, 92, 172 (1934). 100. Ruedenberg K., Poshusta R. D., Advan. Quantum Chem., 6, 267 (1972). 101. Sandars P. G. H., в кн. Laser Spectroscopy III (eds. Hall J. L., Carl-sten J. L.), p. 21, Springer-Verlag, New York, 1977. 102. Sarka K., Collect. Czech. Chem. Commun., 41, 2817 (1976). 103. Sayvetz A., J. Chem. Phys., 7, 383, (1939). 104. Sidis V., Lefebvre-Brion H., J. Phys., B4, 1040 (1971). 105. Смирнов В. A. — Оптика и спектроскопия, 1974, т. 37, с. 871. 106. Smith Т., Ргос Phys. Soc, 46, 344 (1934). 107. Tinkham M., Group Theory and Quantum Mechanics, McGraw-Hill, New York, 1964. 109. Van Vleck 1. H., Rev. Modern Phys., 23, 213 (1951). 110. Walker Т. E. H., Musher J. 1., Molecular Phys., 27, 1651 (1974). 111. Walsh A. D., J. Chem. Soc, p. 2266, 1953. 112. Watson J. K. G., Can. J. Phys., 43, 1996 (1965). 113. Watson J. K. G., J. Chem. Phys., 46, 1935 (1967). 114. Watson J. K. G., Molecular Phys., 15, 479 (1968). 115. Watson 1. K. G., Molecular Phys., 19, 465 (1970). 116. Watson J. K. G., J. Mol. Spectrosc, 50, 281 (1974). 117. Watson J. K. G., Can. J. Phys., 53, 2210 (1975). 118. Watson L K. G., в кн. Vibrational Spectra and Structure, Vol. 6 (ed. Durlg J. R.), Ch. 1, Dekker, New York, 1977. 119. Watson J. K. G., Molecular Phys., в печати.